A few years ago I had a chance to go iceboating for the first time. I must admit this sport was a bit of a mystery to me. I knew a little about it from friends who raced DNs, but I didn�t understand how anyone could sail a boat without being able to see wind on the water. What I learned, after two days of scooting around in Nites and Skeeters on Wisconsin�s Lake Geneva, is that "feel" is everything. The only way to tell how high or low you can steer is by feeling the wind pressure on the rig and the speed of the boat going over the ice. It�s amazing how sensitive you become to these sensations when you can�t see your "normal" clues. In many ways, steering a boat on water is a lot like steering an iceboat. If you want to have a fast hand on the tiller or wheel (a quick "paw"), you need a very sensitive touch. Steering is, by definition, the technique of guiding a boat from one point to another. It�s a fine art that requires concentration, practice and the ability to feel the boat almost as an extension of yourself. Steering is really a series of continual turns, most if which are quite small. Remember what we have said in past columns: Any time you turn your boat, it is fastest to use a combination of rudder, crew weight and sail trim. One of the most important guidelines for fast steering is, "Don�t oversteer." Try to keep your boat going straight and fast by minimizing the amount of drag created by your rudder. When you do need to turn, steer by moving your weight and adjusting sail trim as much as possible. Find a good "batting stance"
Steering a boat upwind has always been one of my favourite parts of sailing. In order to do it well, you should sit or stand in a good place. Be sure you are comfortable, so you minimize distractions and maximize your attention span. Position yourself as high off the water, as far forward, and as far outboard as possible. This will give you the best view of your sails, the waves ahead, and the rest of the race course. Last summer I sailed a bit with Young America (the New York YC�s America�s Cup challenge), and I spent a few days steering their boat Tag Heuer (the Farr-designed AC boat that was sailed by Chris Dickson in the �95 Challenger Trials). One of the best things about this boat is it has a raised platform for the helmsperson that is quite far forward in the boat. This allows the driver to stand almost a foot off the cockpit sole, which makes it easy to see the jib, waves, water and everything else you need to see for fast steering. A good sense of feel. While there are many visual clues for steering a sailboat, perhaps the most important guides are the ones you feel. These include the amount of heel, the sensation of speed through the water and the pressure on the helm. By tuning into these variables and remaining sensitive to how they change over time, you will learn a lot about what your boat needs in order to steer it fast. If you feel the boat speed up or down or heel over, for example, you can probably head up and point a little higher. If the boat slows down or start to level off, you need to foot for speed and maybe ask your trimmer to ease the sheets. Telltales on the jib or genoa. One of the best visual clues for steering upwind are the telltales along the luff of your headsail. This is where I look most often when I�m driving. Like a lot of helmsmen, I probably depend too much on this single source or information. But telltales are a very good indication of how close you are sailing to the wind. By watching their motion (see diagram), I know whether I am pinching, footing or sailing a normal upwind angle. Remember that the telltales don�t always fly the same from top to bottom. Often the top telltales break before the bottom ones. 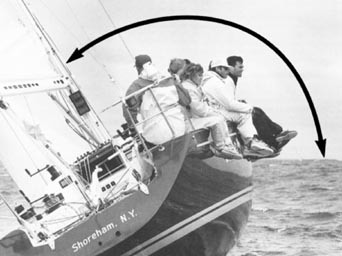 So if you�re steering by the lower telltales, you may be sailing with half the upper jib luffing. Fix this by changing your jib set-up, and/or by watching the telltales half way up the luff (if you can see them). Angle of heel. Buddy Melges is one of many top sailors who use the boat�s heel angle to help them steer fast. The easiest way to keep track of heel is by watching the angle that your forestay makes with the horizon (see earlier photo). Heel angle is basically another way to gauge how close you are sailing to the wind; e.g. the higher you point, the less you heel. Instruments. If your boat is big enough to have instruments, one of your priorities should be to develop upwind target speeds for each wind velocity, and then post these within easy sight of the helmsperson or tactician. These numbers are invaluable for knowing whether you should steer the boat faster or slower at any given time. Be sure to mount your boat speed readout (and other important instruments) on the mast or some place where it�s easy to read while looking forward. That way you can simultaneously watch the instruments, telltales, waves and angle of heel without having to look down. Use a "lookout." The ability to anticipate changes in conditions is key for steering. For example, it helps to know ahead of time if you will have to head up for a puff or head off to punch through waves. To improve your ability in this area, assign one of your crewmembers to watch continually for puffs, lulls, waves and flat spots. On small boats, this lookout often must be the skipper because the crew may not have a very good view of the race course. On larger boats, the tactician and/or a crewmember sitting on the rail usually keeps a lookout. Communication should include comments like: "Two steep waves ahead," "Puff coming in 20 seconds," or "Do you see the starboard tacker?" Make sure all feedback is loud enough to be heard by both the helmsperson and sailtrimmers. Unless your helmsperson is a quiet freak, communicate everything you see that may have any importance, even if it seems obvious. Other boats. Especially in one-designs, steering technique depends a lot on how you�re moving relative to other boats. When I�m driving, I like to have one crewmember (it could be the lookout) give me continuous readouts on our speed and height compared to our "neighbours" (especially the ones behind my back or under the jib where I can�t see). This information feedback helps me know whether I should steer higher or lower. If we have a speed problem, I�ll ask for feedback on what other boats are doing. 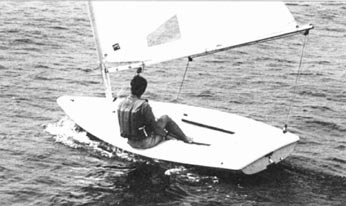 Often a slight change in sail trim or steering technique will make a difference. Practice and experience. Time in the boat is usually the best way to learn how to steer fast. Get as much stick time as you can in a variety of conditions. When you are steering, whether it�s during a race or in practice, focus 100% on driving the boat fast. Try different things to see what works, and what doesn�t work. Whenever you have a chance, go racing (or practicing) with another sailor who is a very good helmsperson. Watch him or her carefully: Where is he/she looking? What does he/she communicate to his/her sailtrimmers? etc. Invite him or her to come sail with you during a practice session and give you a critique on your steering, By putting in a lot of effort and keeping an open mind to learning, you�ll be doing the most you can to develop a quick paw. The action of your jib telltales is a good guide for steering fast upwind. You want the leeward telltales streaming straight back almost all the time. On the windward side, the optimal telltale action depends on a number of factors like your speed, wind, waves and tactical considerations. � You need to accelerate. By putting the bow down, you �press� on the sails for a speed build.